One of the biggest hoaxes of American history is that the Civil War ended back in 1865. Unfortunately, it has not ended yet. What was achieved back then was an armistice, similar to the situation between the two Koreas. As the current logjam in the U.S. Congress makes plain, the Civil War is still very present in today’s America – and with virulence that most other civilized nations find as breathtaking as it is irresponsible. There are plenty of U.S. commentators now who try to make light of the current situation in their country. They argue that it is just a bunch of crazy Tea Party Republicans that are causing the current mayhem. Such an interpretation underestimates the forces of history and the continuing deep divisions of American society. This underscores that what is really going on in Washington today is a replay of the Kulturkampf, a period of German history that occurred in the 1870s. At the time, that country’s modernizing forces resolved to fight back against the economically retarding influence of conservative religious forces, mainly the Catholic Church. Germany’s mid-19th century Catholic Church, a very powerful economic force at the time, fiercely resisted any suggestions of modernizing the social structures of society – just as many Republicans do now. It sought to preserve the economic power of the well established, largely feudal-era interests, i.e., its own – much as Republicans do now. The fight in Washington thus is not about any of the things in the headlines, be it the budget, debt or “Obamacare.” These are merely proxies in a much more fundamental battle over the future structure of American society. Democrats want those structures to be opened up, to create more economic rights for the underprivileged, so that the national economy can grow in the future. To Republicans, any investment in these and other long-term causes is a net negative on what they see as their core mission – defending the interests of rich Americans. Thus, we are largely dealing with a battle over redistributing shares of economic power, covered up in the clothing of cultural values. That is why it is so bitterly fought. To either side, the entire future of the country is at stake. The proper way to understand the slavery issue as well as the health care law, therefore, is to see them as symbols of much deeper conflicts. As it turns out, even the parallel developments in the legislative process are amazing. Slavery was formally abolished in the United States in 1865 and, for a few years, in the period of Reconstruction, there seemed to be a will to move the country ahead. But even back then, the intended key reform component was never really followed through. That step was setting up a bank that would also get involved in granting freed slaves loans, so that they could build a prosperous future for themselves and their families. The Freedman’s Bureau lingered on for a few years, before it essentially faded away. The economic, social and cultural consequences of condemning freed slaves essentially to a life of continued servitude, albeit of another kind, are well known. They are the root cause of the culture of dependence that sadly continues to this day – and that today’s Republicans are quick to use as a justification not to do more for African-Americans. The Affordable Health Care Act passed the U.S. Congress, just as the Freedman’s Bureau had been established in 1865. With their countless defunding moves, the Republicans are pursuing a similar strategy, as was the case with the Freedman’s Bureau before. In today’s case, they are trying to prevent that nationwide access to health care can truly become reality in the land. Amazing how history repeats itself. Of course, there is one very important distinction – and one that should truly make today’s Republicans squirm. 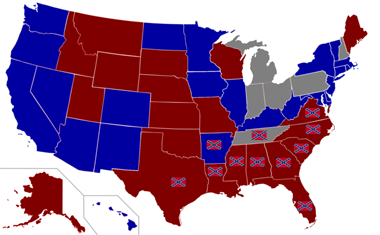 In the case of the U.S. Civil War of 1861-65, it was the Republicans, who were mostly found in the north at the time, who were the political force aligned against slavery (President Lincoln was a Republican), while it was Southern Democrats who fiercely resisted its abolition, as well as resisting the Civil Rights Act one hundred years later. In essence, now the South is once again rebelling against modernizing shifts of American society. Today, in one of the great political realignments of modern politics, that region is the power base of Republicans. The equivalent of politically and economically freeing the slaves back then is now granting health care access to all Americans. In either case, the old order is about to be toppled and that leads especially Southerners and white conservatives everywhere, to fear for the end of the United States, as they know it. Back then, they felt the abolition of slavery and the economic independence of blacks had to be prevented at all costs because the Southern state economies and their leaders’ personal wealth depended on slavery and the economic suppression of the ultimate underclass. Now, the move by Obama to declare that the state plays a role in securing that all Americans are under the umbrella of health insurance plays the role of the secessionist cause. Look at the list of state governors who refused to expand the medical program for low-income people (Medicaid) and compare that to the list of states that fought to preserve slavery. There is an amazing overlap. There is one more big irony to be pointed out in a historic context: It would be a great injustice to conservatives anywhere on the planet to agree with U.S. Republicans that opposing health insurance coverage for the entire population is conservative in any sense of the word. One of the world’s greatest archconservatives, the then German Chancellor Otto von Bismarck, introduced health coverage for all Germans as far back as 1883. What is it about U.S. “conservatives” that, by 2013 – 130 years after Bismarck – they cannot muster the same degree of enlightenment as Bismarck? The present state of affairs runs amazingly counter toAmerica’s global ideology. According to its self-promotion, the United States casts itself as the modernizing vanguard of humanity. In light of what’s going on in Washington today, it is evident that close to half of the U.S. Congress wants an America that is more conservative than Bismarck’s 1880s Germany.